The method presented below can be used to track any log attribute in Splunk; this example demonstrates watching MD5 hashes of executed files and loaded modules. I’ve enabled Process Auditing via the Group Policy Editor and configured WLS to provide MD5 hashes. and configured it to provide MD5 hashes for these as well. Now that we are receiving hashes for all executed files and loaded modules, let’s start tracking them in Splunk. 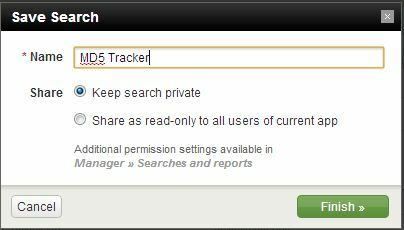 This will create an empty csv file named “md5tracker.csv”. Next, we need to search for and add the desired data to the csv file. I like to preserve some of the metadata that WLS reports with each record for later use – avoid re-searching, etc. and schedule it to run every x minutes for the last x minutes; I schedule mine for every 15 minutes. Once this is complete you’ll now have a search that keeps your lookup table up-to-date. Now what? What you do next depends on how closely you feel this needs monitored. 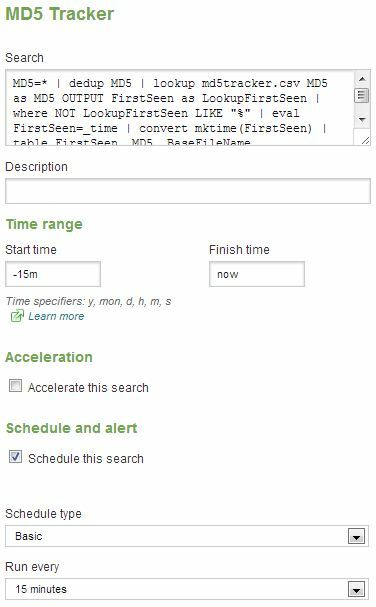 I run a second search every x minutes that alerts on all new entries in the last x minutes (based on the FirstSeen) field. This simply take the entire table and selects all entries in the last 2200 seconds (2200 / 60 = 36.6 minutes) and formats the results into a table. I scheduled it to run every 35 minutes with some overlap time (hence 2200 instead of 2100). I currently have 23,537 executable hashes and 131,885 module (dll, etc) hashes, and see a few new ones at most search intervals during normal business hours. After the initial gathering, the periodic alerts are easy to quickly review, and you’ll know everything that is running on your Windows hosts. This entry was posted in Splunk, WLS and tagged Comma-separated values, hash, hashes, Lookup table, MD5, Microsoft Windows, modules, Process auditing, Splunk, Windows, WLS on June 3, 2013 by digirati82. To comment on the end, you can always install the “getwatchlist” Splunk app and monitor the Cymru’s Hash database automatically in Splunk. Then do the comparison right in the Splunk search — much easier and automatic! Mind updating the article with the mentioned module when you have a chance? If I get a chance to try it out, I definitely will. But I can’t to find any info about WLS (no value in registry), can you get any links to read about it? How to install it? It’s some software that I’ve developed, which I hope to make available more widely soon. I’ll post more details on my blog when it’s publicly available. Thanks for the interest! Isn’t process tracking generating a massive amount of events in Splunk? Do you have any numbers on that? Process tracking does indeed generate quite a few logs. What I found though was that log forwarders such as Snare and the Splunk Universal Forwarder send the old style logs with white space and the MS description of the event every time. Since WLS parses all logs into key/value pairs, eliminating that narrative, even with the (optional) extra data, there was less data being indexed. Currently, with the majority of optional data included – watching loaded modules, mutexes, semaphores, process tracking, hashing, etc – I see an average of < 5MB / day / host (total). I did a quick check for a single day and saw ~1750 process creation/termination logs per host in a 24 hour period. Also, the data being provided is extremely useful not just for finding new binaries, but checking for people using old / vulnerable software, watching new software roll-outs, and of course, tracking malicious activity.